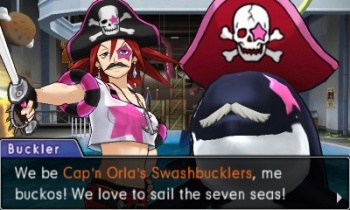 Seek justice for a wrongly-accused orca whale as only the spikey-haired Ace Attorney can. Fans who have already torn through all five acts of Phoenix Wright: Ace Attorney - Dual Destinies will get another reason to break out their 3DS next week with the release of the "Turnabout Reclaimed" DLC. Due Thursday, Nov. 21, the new sixth episode will take place before the end of the game. It covers Phoenix's first case after getting reinstated as a lawyer, where he will use all of his lawyering ability to defend a killer whale and its owner, Sasha Buckler, on charges of murder. No word yet if we'll see angry whale supporters outside the courtroom holding "Free Willy" signs. The new episode will cost $6. All the investigation and interrogation techniques from Phoenix Wright: Ace Attorney - Dual Destinies, such as the new Mood Matrix system, will be used again in "Turnabout Reclaimed." The DLC was announced in July. For more information on Phoenix Wright: Ace Attorney - Dual Destinies, check out our review.